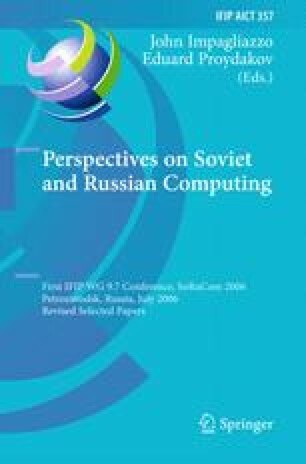 The S.A. Lebedev Institute developed operating system for the AS-6 distributed computing system (OS AS-6) in the 1970s. The OS AS-6 consisted of peer operating systems of separate machines making up the AS-6 computer system. Those operating systems interacted through a uniform interface. The OS AS-6 facilitated interaction between computation processes on the nodes of the AS-6 system through a network together with their interaction with the global network. It provided the possibility for any process in the AS-6 system to use all the devices connected with the nodes of the AS-6 computer both with addressing and with usage of external devices. It also supported a pipeline operation of the computers in the AS-6 system performing real-time processing of large data streams of spacecraft missions. The operating systems of the nodes of the AS-6 system had a special means for parallel processes management, including task hierarchy organization and information processing management within a single task.